Kashmir – the mighty king in the north encompasses the best of lush pastures, tall mountains, dancing rivers, and oozing energy in the air. The land prides itself in being home to almost 12 million people. There are heavenly places to visit in Kashmir, idyllic and concealed in the quietude of the valley, longing to hear your footsteps soon after the winter snow subsides and nature flourishes under the shining sun yet again. 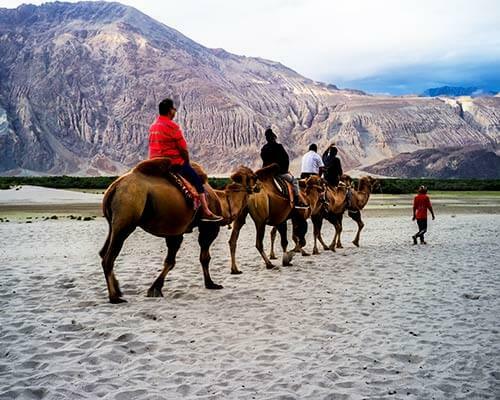 You’ll find everything here from majestic mosques and blooming gardens from the Mughal era to lakes oozing romance and national parks showcasing the best of Himalayan biodiversity. 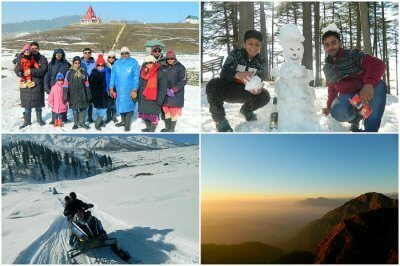 The best places to visit in Kashmir, well known and lesser known, know how to calm down your wanderlust! 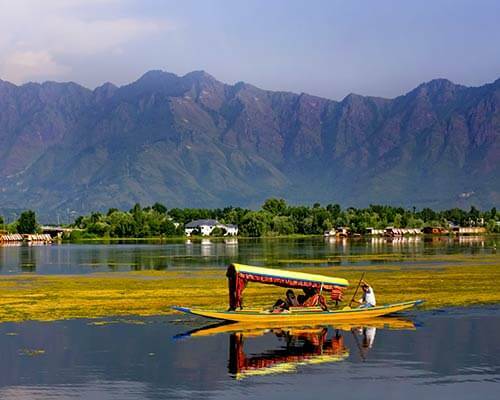 April to September is the best time to visit Srinagar. During these months, the temperature remains between 14 – 30 degrees Celsius. Heavy snowfall blocks the mountain passes and makes the valley inaccessible during winters. 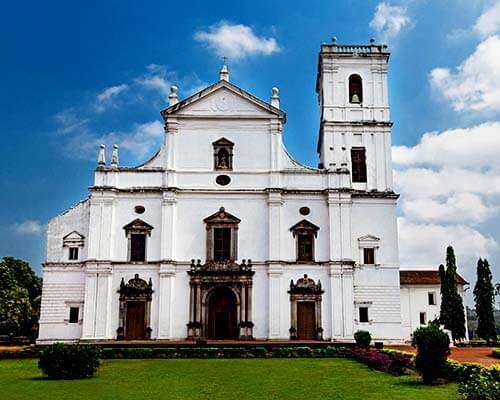 Here are some of the top attractions you can explore in this paradisiacal city and you’ll why all nature and history lovers are smitten with its charm! 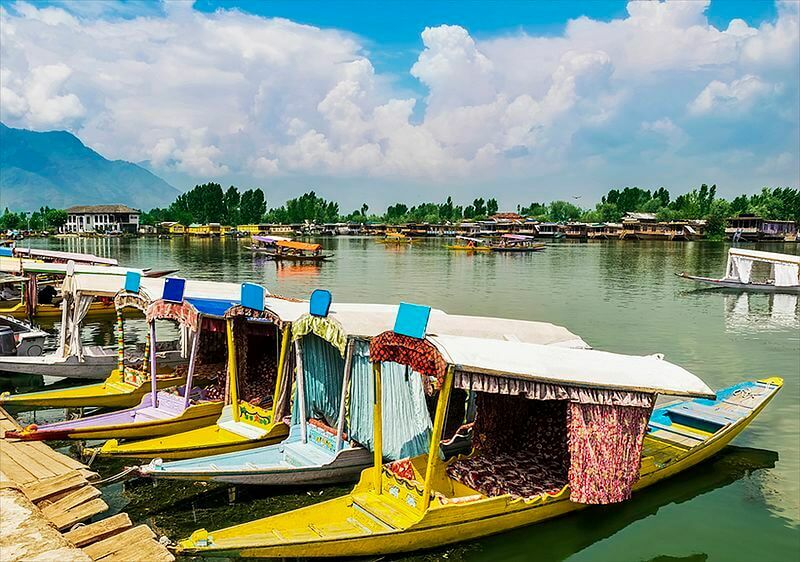 Carrying the oldest legacy of Kashmir, of being a popular location to enjoy a shikara ride or a houseboat stay, Nigeen is certainly a hot favorite place. 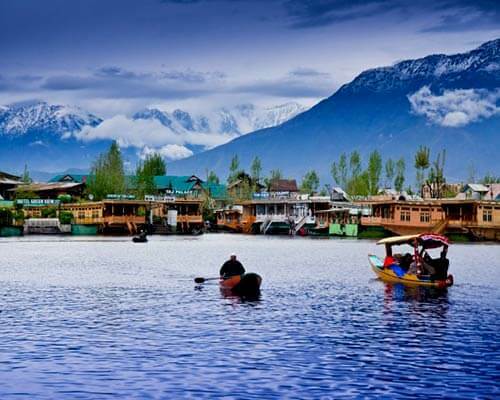 The beautiful lake destination in Kashmir features some of the topmost houseboats in Srinagar and offers a range of romantic activities, especially for honeymooners. Historical structures and natural escapades around the lake put it atop the list of most important things to do in Kashmir. 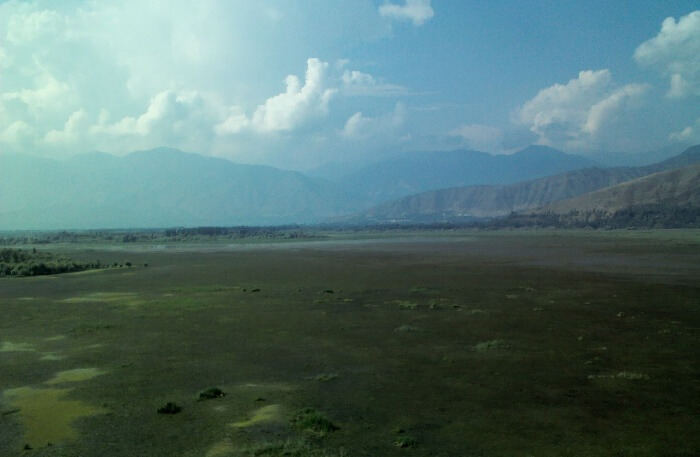 Fed by river Sutlej, Wular lake is a popular tourist attraction at a distance of 65 km from Srinagar. 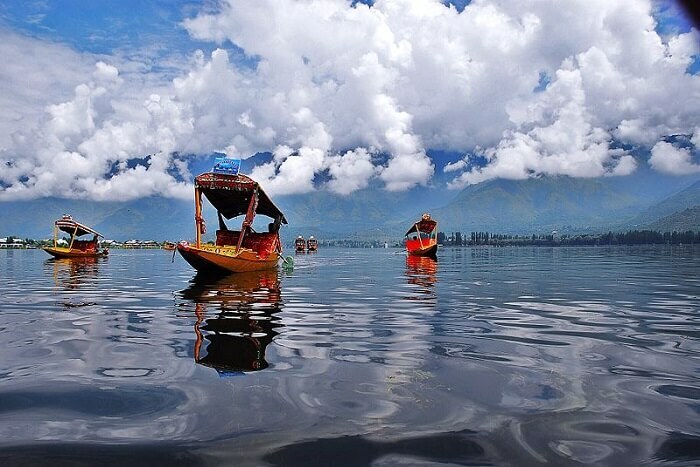 Located in the Bandipora district, the lake is one of the largest freshwater lakes in Asia that leaves the travelers spellbound as they sail across the lake on a shikara or a boat. 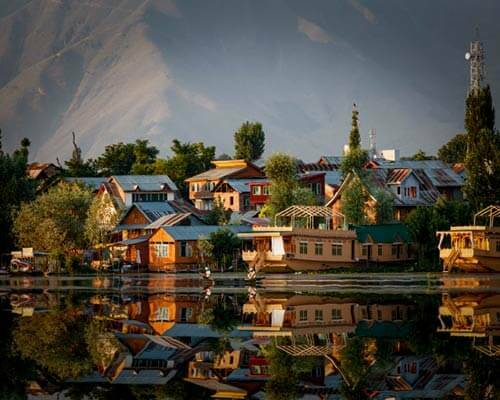 And the beauty is breathtaking; it couldn’t get better for a nature photography enthusiast who’s looking for the most photogenic places to visit in Srinagar, Kashmir. One of the 26 wetlands of India, the lake has the best of nature views around, which makes it one of the best places to visit in Kashmir. Serene as it looks, the lake water is considered inappropriate for swimming. Behold and appreciate! Till date, Kashmir has managed to retain its rustic charm. And there’s so much to explore in the valley that even the most avid travelers haven’t seen all of it. In the list of hidden Srinagar tourist places is Chatpal in the Shangas district of South Kashmir. 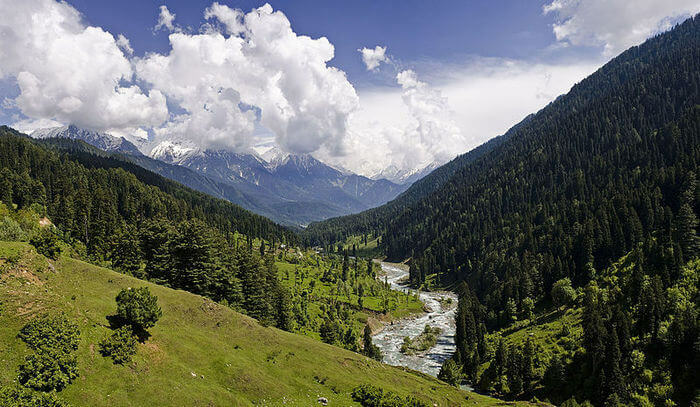 Located 88 km from Srinagar, this spellbinding place is the popular turf for nature enthusiasts. With verdant peaks, and gushing river streams cutting through the impregnable woods, there’s nothing more enchanting you’d find in the city. 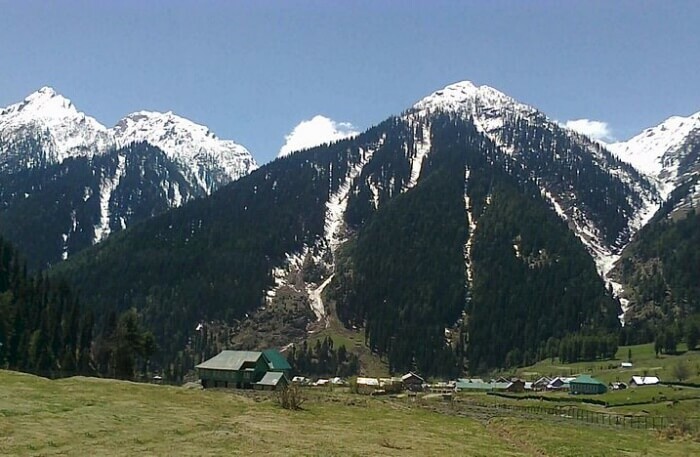 Sunny Deol starrer Bollywood flick Betaab was the inspiration behind the name of this picturesque valley located 15 km from Pahalgam in the Anantnag district. Romantic climate, breathtaking location, and dancing streams cutting through the valley make it one of the best places to visit in Srinagar. Picnic spots, shooting trees, and absolute greenery makes Betaab Valley truly an exceptional destination in Srinagar. 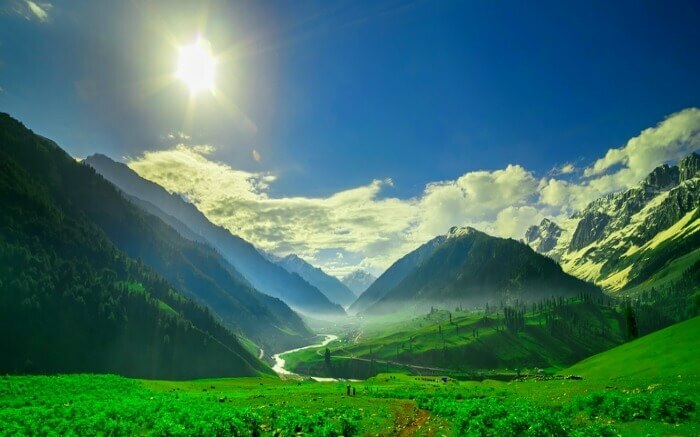 Popular attractions around Betaab Valley: A stay in the wonderful hotels and cottages around the valley is highly recommended. 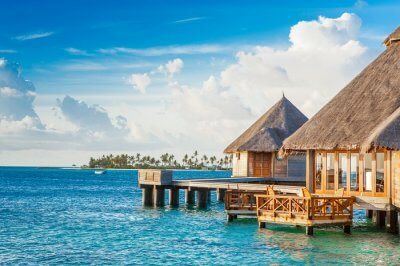 Island Resort, Hotel Himalaya House, and Forest Hill Resort are a few of them. The actual colors of Kashmir ooze from its vast valleys. Aru Valley in the Anantnag district, around 100 km from the capital city, is one of the best Kashmir tourist spots. The Valley is the perfect place for adventure lovers and also acts as the starting point to Kolahoi Glacier and Sonamarg Trek. 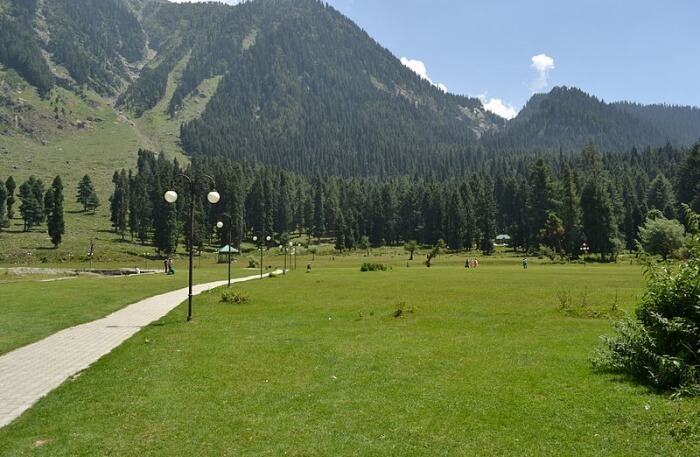 Pahalgam is the nearest town at a distance of 12 km from Aru Valley. The beauty of snow-capped peaks, and towering pines make it one of the best places to visit in Srinagar. What used to be the favorite leisure activity of Mughals, (gardening) today thrives as a wonderful crown of the Kashmir Valley. 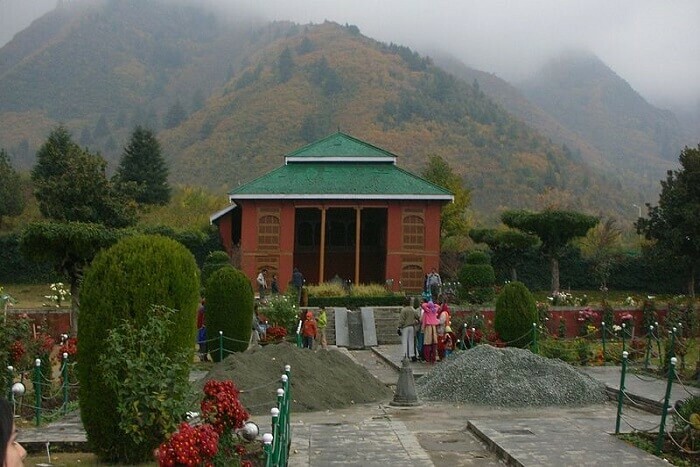 Following the Persian style of architecture, the Mughal garden is a lovely tourist attraction in Kashmir. Holding Dal Lake in the background, this one of the popular Srinagar tourist places encloses beautiful moments and monuments. 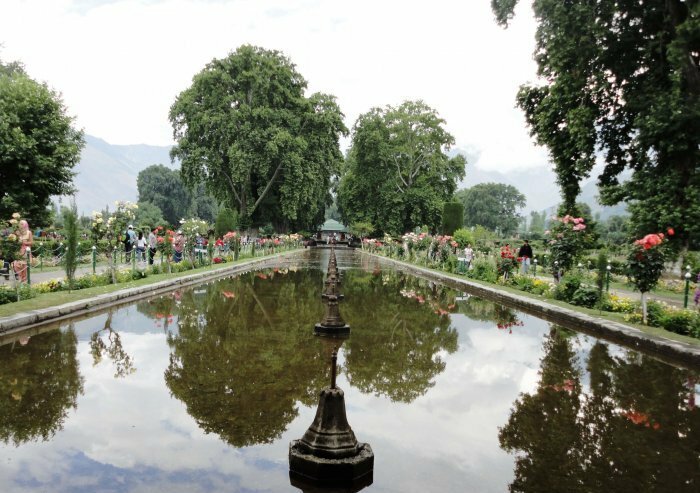 A UNESCO World Heritage Site, the garden keeps flourishing with greenery and indigenous flower species and is a prime attraction close to Dal Lake. The name Dachigam translates to 10 hamlets that fall under its wide area of 141 sq. km. 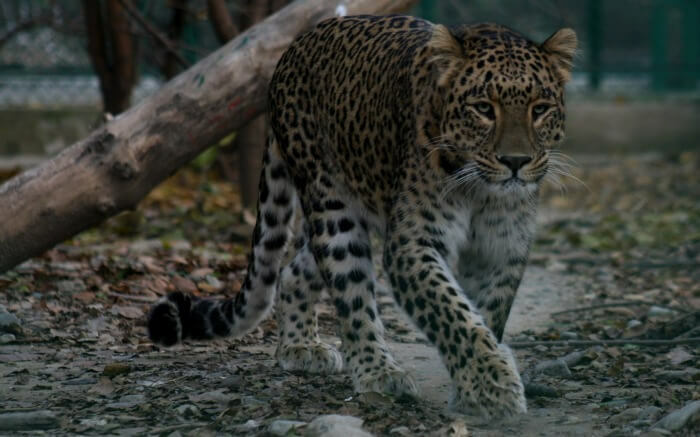 Some 22 km from the Srinagar main town lies Dachigam National Park – a perfect sojourn to explore the best of conserved wildlife in the Kashmir valley. 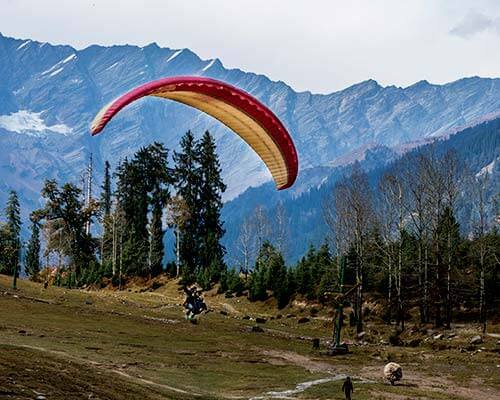 One of the most important Srinagar sightseeing places, Dachigam is known as popular dwelling spot of Kashmiri Stag and Himalayan black bear among other species of flora and fauna. 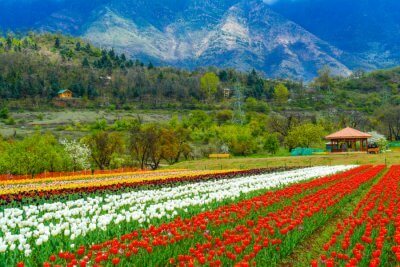 Rows and rows of tulips of different colours with mighty Zabarwan Hills in the backdrop, sounds like Heaven doesn’t it? Well, this garden is exactly that! 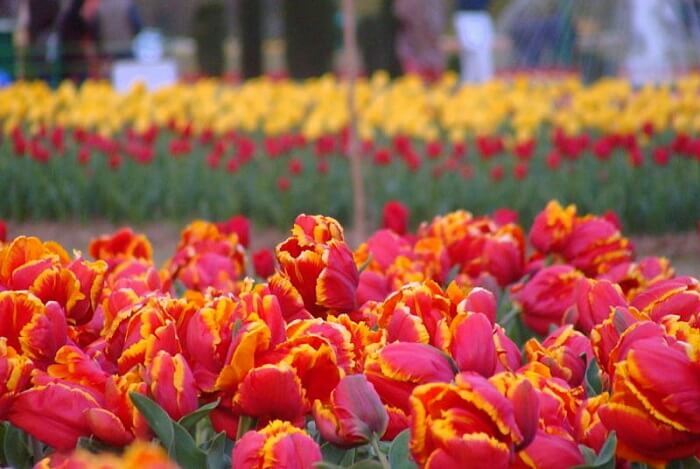 The Indira Gandhi Memorial Tulip Garden offers views that will surely be etched in your mind forever! And the cool breeze along with a sweet aroma of hundreds of tulips is a cherry on the cake! It’s the one place in Srinagar that you should not miss out on. 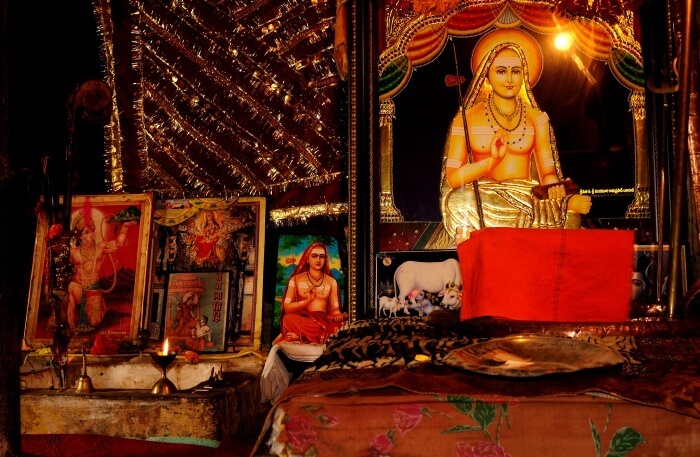 Believed to be the oldest shrine in the Kashmir valley, Shankaracharya Temple is one of the renowned Srinagar sightseeing places to catch the majestic nature at its best. 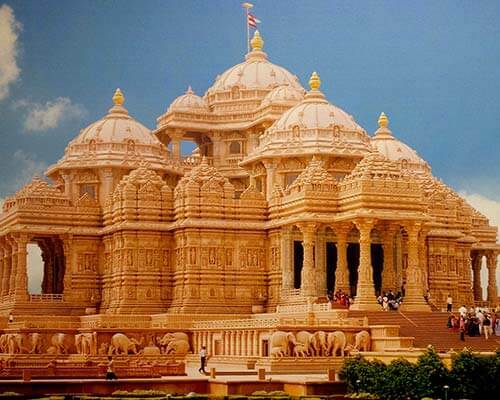 It is an architectural marvel, stationed on a hill peak, 1100 feet above sea level. The view from the top is truly enchanting, especially from May to September. Standing on the left bank of Dal Lake, Hazratbal is a popular tourist attraction in the vicinity of Srinagar town! 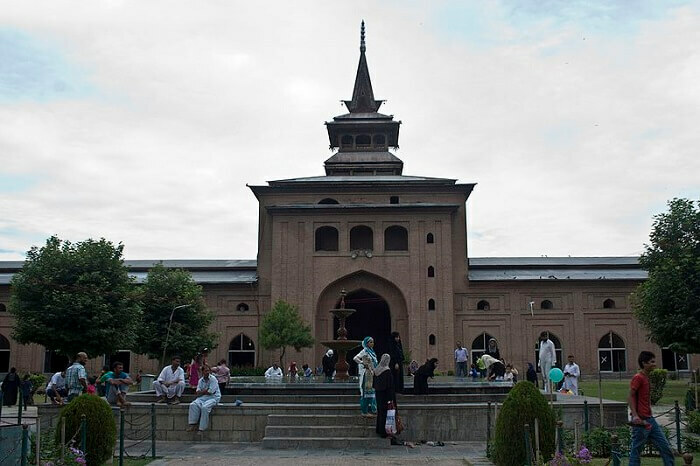 One of the popular places to see in Srinagar, the mosque has been a bang on tourist attraction in the valley that has retained its rustic charm for almost 3 decades. The beauty, sculpted out of white marbles is definitely a captivating watch around the Srinagar city. There’s a lot of preservings in the mosque like the immaculate design and huge dome. Yes, Hazratbal is the only domed attraction, without visiting which no tour to Srinagar is complete. 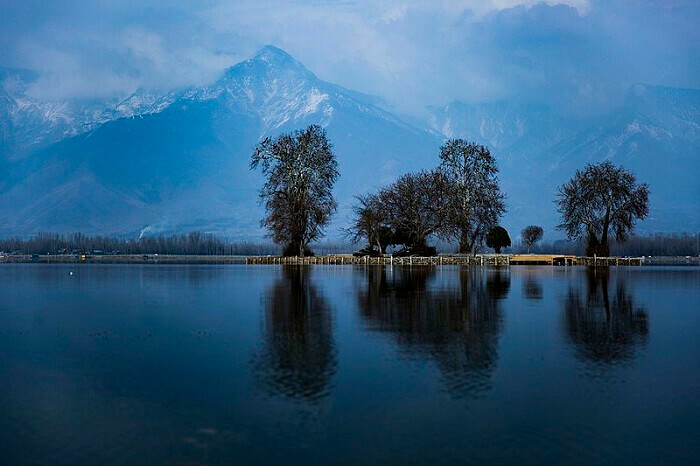 30 km from Srinagar, Awantipora is one of the popular tourist places in Srinagar that must not be missed! The place is famed as the erstwhile capital city of Awantipora during ancient days. The ruins also showcase the fine architecture and art during good old days! Lalitaditya was the ruler who got the temple constructed that now stands in ruins. 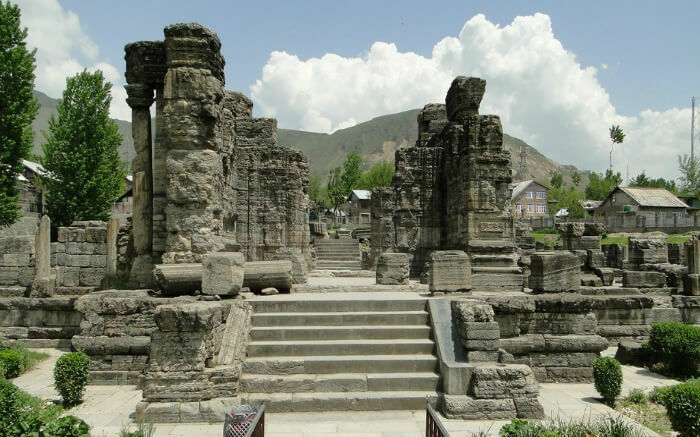 It is a popular historical site in Awantipora and one of the best places to visit in Srinagar. 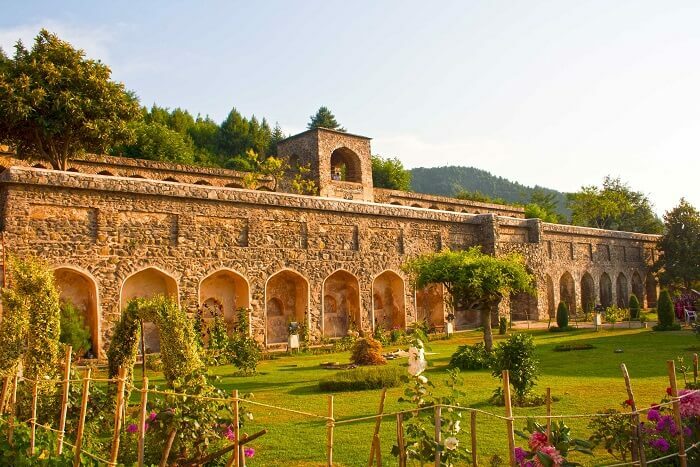 One of the offbeat places in Srinagar, Pari Mahal is a stunning historical monument situated right next to the Chashme Shahi Gardens. Built in the classic Islamic style of architecture, this palace is one of the most significant historical structures owing to the fascinating history behind it. It is also known as the home of fairies courtesy the six well-maintained terraced gardens it boasts of right on top of the Zabarwan Hills. Other than giving history geeks a glimpse into the Mughal lifestyle, this place also attracts a number of nature lovers owing to the beautiful views and the lovely gardens. 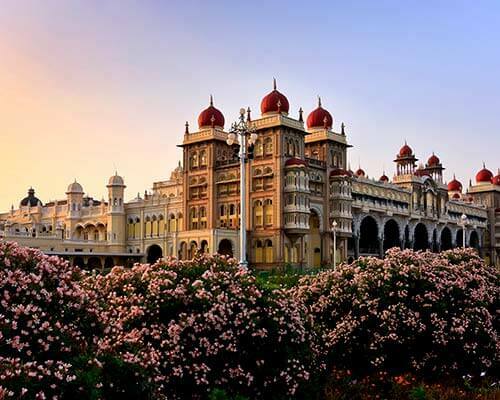 The palace, complete with these mesmerising gardens, are truly a treat for sore eyes! One of the top places to visit in Srinagar is surely this lake which is known to have defined the town in one word- ‘beauty’! One gets to witness an absolutely splendid view here with lush green mountainscape in the backdrop and a crystal clear reflection of the sky falling upon the surface of the lake just to make it more pristine in every sense! 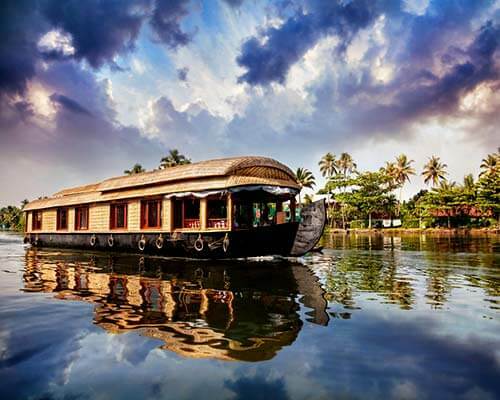 If you’re planning to go on a Shikara ride around the region of a mesmerizing island lake, make sure you ask your shikhara to be steered in this direction. 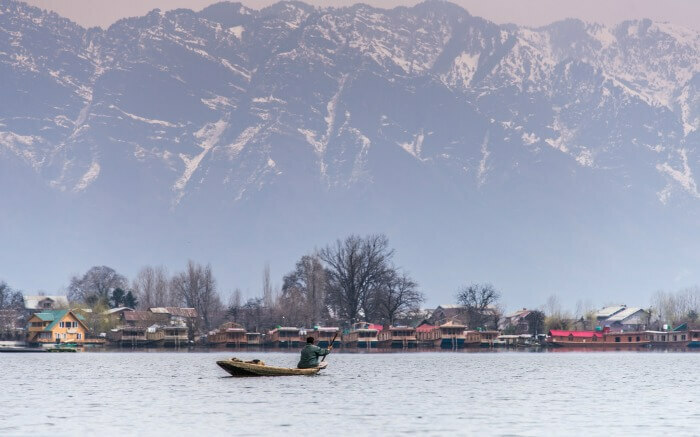 Char Chinar is the name of a mesmerizing island that is situated in the middle of Dal Lake and is covered with Chinar trees that add to the scenic charm of the entire place. It is also a perfect spot to click those perfect selfies! Suggested Read: 8 Best Restaurants In Srinagar To Treat Your Taste Buds To Authentic Kashmiri Cuisine! 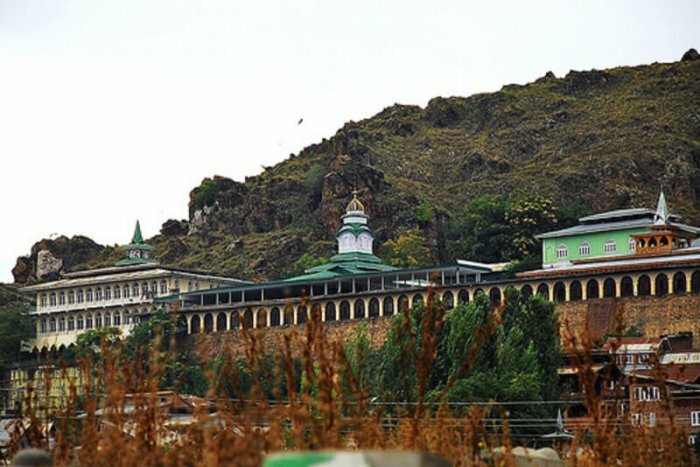 One of the most blessed places to visit in Srinagar city is this ancient mosque which was established almost 600 years ago by Sultan Sikandar Shah Kashmiri Shahmiri. 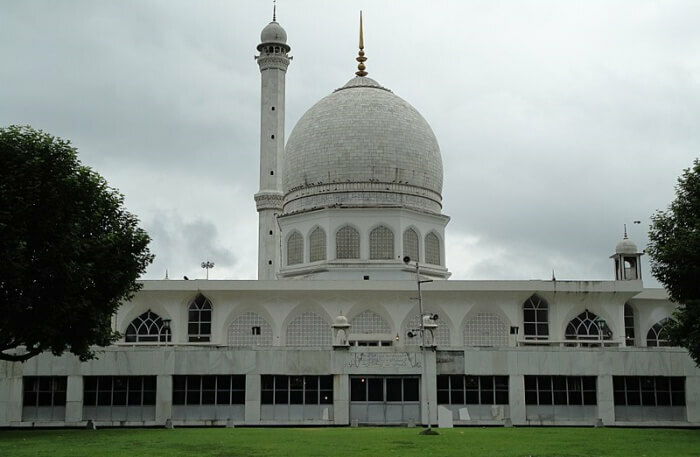 It is also said that the history of this serene mosque has been going parallel to the various ups and downs that this place has seen in terms of elections and the like. 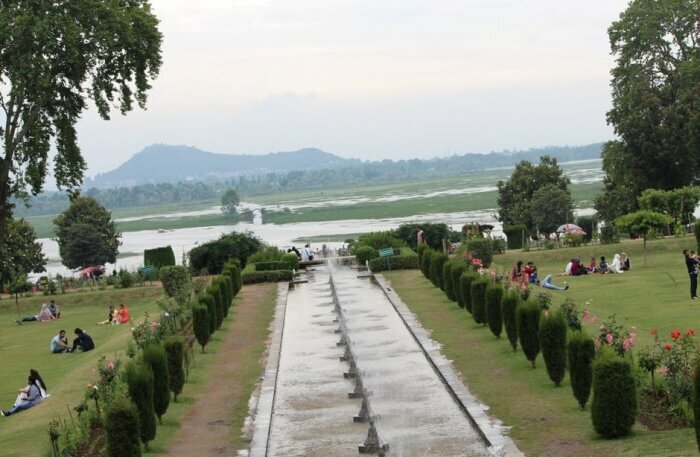 A magnificent botanical garden with mesmerizing views and spectacular scenery of Dal Lake in the background, Nehru garden is what you ought to check out while you tour theplaces to visit in Srinagar, Kashmir. With absolute peace in the surroundings, who would possibly want to miss out on a Sunday picnic with your folks here? 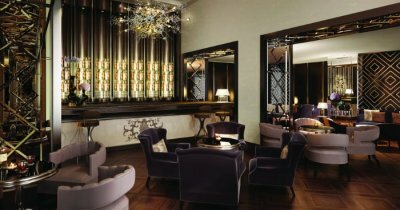 Suggested Read: 10 Best Resorts In Srinagar: A Taste Of The Kashmiri Heritage With A Touch Of Royalty! The perfect location of this charming garden on an elevation offers just the right kind of setting for you to capture the picturesque beauty of the city. 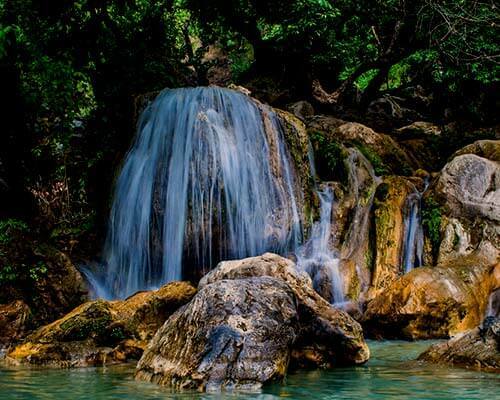 Being one of the famous tourist destinations, Chashme Shahi have serene waterfalls on board that will simply leave you spellbound by the stunning views. 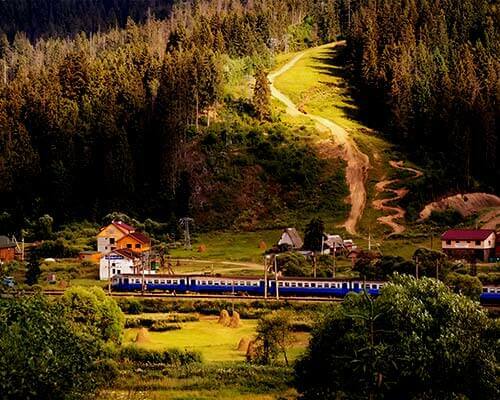 Don’t forget to visit one of the most gorgeous places to visit in Srinagar, Gulmarg and Pahalgam. Located on the outskirts of the city, the Shalimar Bagh is an extraordinarily beautiful garden in the whole state. 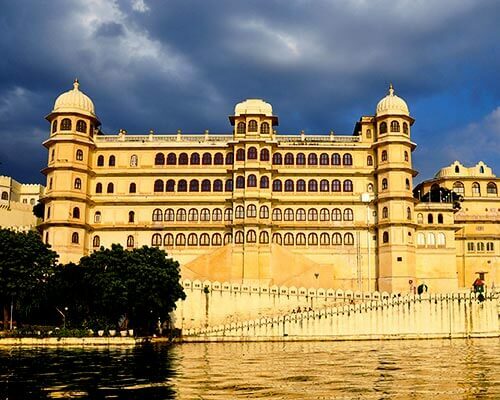 It was built in 1619 by the Mughal Emperor Jahangir for his beloved wife Nur Jahan. 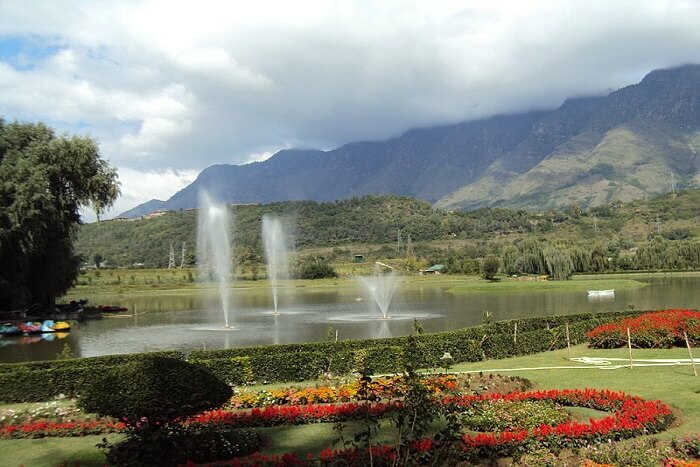 This place attracts thousands of tourists from all over the world who come just to witness its horticultural charm. If you are looking for top places to visit in Srinagar, Kashmir, this place has got to be on your list! A small yet very intriguing place, Challi Point is a famous attraction in Srinagar. 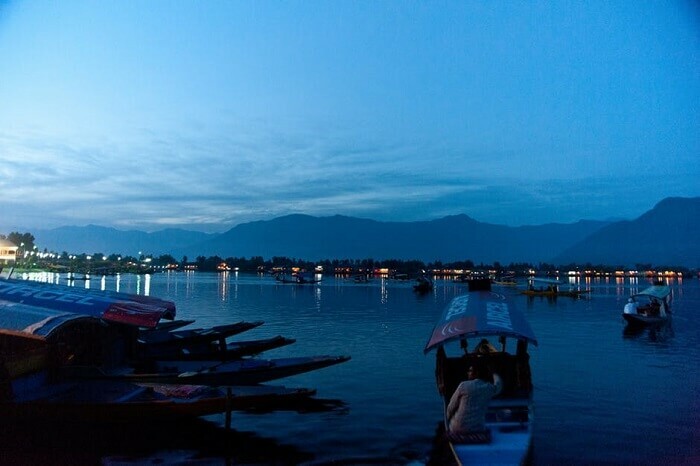 With a gorgeous backdrop of Dal Lake, this place creates a perfect atmosphere for tourists and locals alike to enjoy the view while they savor some of the most delicious kebabs and corns from the small stalls set up here. Opened every day from 10 am to 5 pm, this place in Srinagar is dedicated to the Sufi saint Sheikh Hamza Makhdoom. It is located towards the south on Hari Parbat and attracts innumerable pilgrims every year. 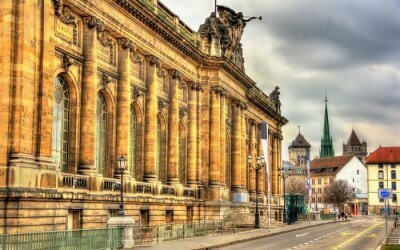 You can visit this place to visit its architecture and soak in the eternal bliss that environs this attraction in the city. Srinagar Airport is the nearest airstrip which is well connected with major Indian and a few international cities as well. 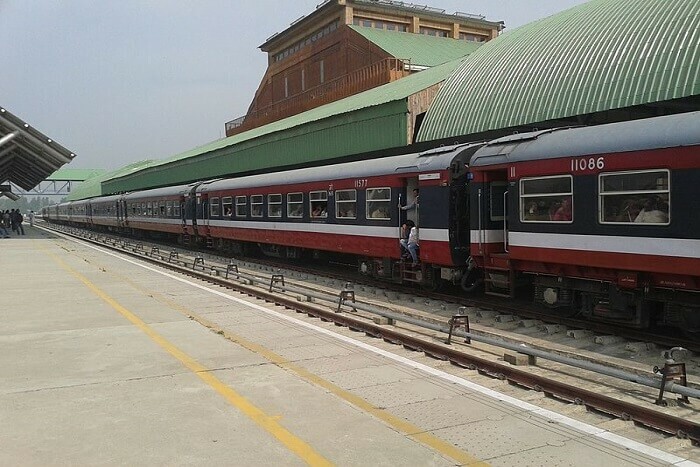 Udhampur Railway Station is the nearest railhead to Srinagar. Buses and private vehicles ply from the railway station to the city on a regular basis. Regular buses operate from Jammu to Srinagar in tandem. 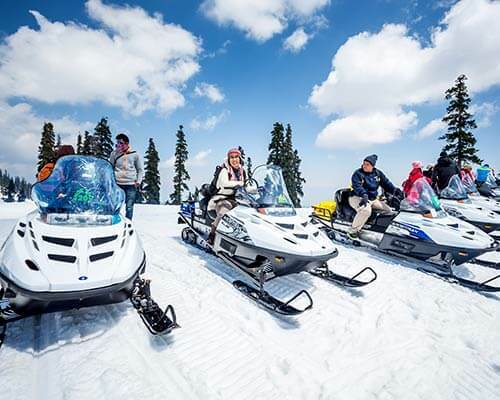 Also, there are ample of options to travel to Srinagar by a private vehicle. Places like Kashmir make you realize how divine power works in some of the most strange ways and turns everything around into a blessing. Plan a trip to Kashmir now. And if you know of any more places one can explore in Srinagar, let us know in the comments section below. Q. Which is the best time to visit Srinagar? A. The best time to take a trip to Srinagar is between April and October when the weather is perfect for sightseeing and engaging in different activities in this city. Q. Which is the most beautiful place in Kashmir? A. It’s not possible to single out one such place in Kashmir. 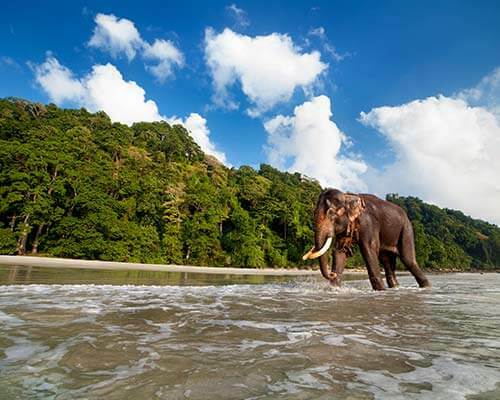 Every corner of this state is a mini-paradise in itself owing to the abundant natural beauty and serene landscapes. From Srinagar, Gulmarg, Pahalgam, Sonmarg, To Ladakh, every place in Kashmir is unique and pretty in its own way. Q. What can I buy in Srinagar? A. You can buy everything from hand-woven carpets, Pashmina shawls, antique silver ornaments, papier mache products, dry fruits, spices, traditional Kashmiri handicrafts, and much more while shopping in Srinagar.